Whether the headlines on December 21, 2012 will read "Apocalypse Now!" or "Only four more dhopping days till Christmas," DeKorne tells us, the imperative remains the same: Life is short. Death is certain. Do the Work in the space in which you find yourself. Far from a doomsday perspective, The Cracking Tower grabs the existential bull by the horns to ponder the opportunity that our apocalyptic anxieties hold for greater self-understanding. While end-time fatalism has a bad habit of crushing hope and one's sense of control, a healthy dose of urgency can help sharpen our dulled sense of priorities. 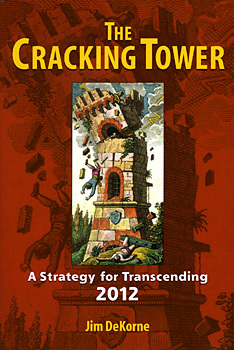 The Cracking Tower moves beyond psychedelics and Mayan calendar algorithms to view 2012 from the wider perspective of the Perennial Philosophy, the archetype of human consciousness and esoteric foundation of all world religion. Exploring the neglected realms of our relationship to ego and Self, Jim DeKorne expertly weaves together diverse threads from Jungian theory, Kabbalistic wisdom, shamanism, gnostic cosmology, reincarnation, astral projection, and quantum reality into a coherent vision of the challenges and potential that inhabit our modern psyche. Jim DeKorne was active in the civil rights and antiwar protests of the 1960s, the Back-to-the-Land and Appropriate Technology movements of the '70s and '80s, and the Psychedelic Renaissance of the '90s. The founding editor/publisher of The Entheogen Review, DeKorne holds a master's degree in creative writing and is the author of four books. He lives on the Big Island of Hawaii.